I met Jen from Approach Guides outside her office building in midtown Manhattan, a few blocks south of Grand Central Station. We walked to a nearby cafe she knew, where we lucked out and managed to acquire seating. I hadn't done my homework. I'd seen Jen's tweets, however I'd only given the website a cursory overview. On the other hand, I didn't feel too guilty. I'm finding it's much more fun to learn about a person's blog or project while you're sitting in front of them, and can feel their excitement. In addition, to getting the background on how Approach Guides came to be, we talked about travel, social media, and the new project I've been working on (stay tuned in 2010!). Jen – thanks again for the coffee and cookie! As we parted, she also offered me a complimentary guide from their collection, which I look forward to reading and writing about in the near future. 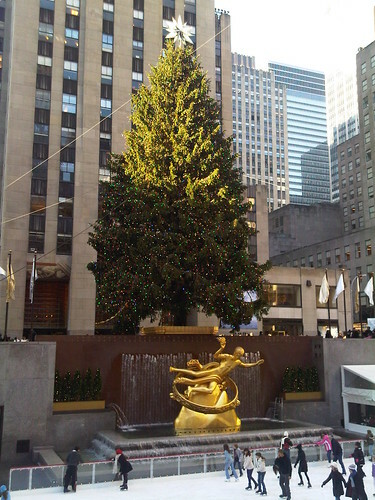 On my own again, I made it my mission to check out the Christmas tree at Rockefeller Center. I took the scenic route, walking through Grand Central Station and Time Square, where I came across Sam Ash, the popular music store chain. Back when I use to play the guitar in my teens, I'd look through their catalogs and dream of getting a Gibson Les Paul (like Slash) or a sunburst Fender Strat (like Stevie Ray Vaughn). To appease my inner child, I walked into the store which occupied the former space of another famous store, Manny's (featured in the Guns ‘n Roses video for “Paradise City”) and browsed the massive collection of guitars they have on the first floor. After getting my fill of beautiful, expensive electric guitars, I hit the streets again, walking past Radio City Music Hall. 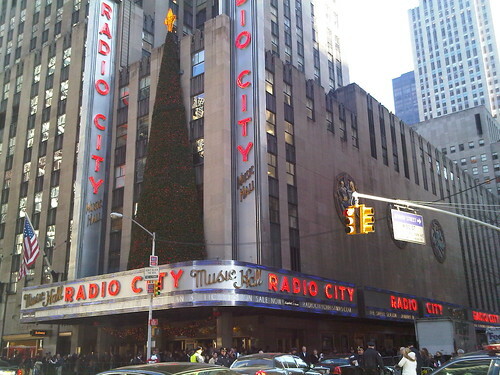 When I was an even younger kid, and my family still lived in the suburbs of the New York City, we'd go to Radio City to see the Rockettes perform around this same time. And with a little help from Google Maps on my BlackBerry Curve, I reached 30 Rock. My first view of the tree and ice skating rink resulted in a thought along the lines of “damn, that's way smaller than I thought.” I always knew the camera angles played a big part in making the Rockefeller Center Christmas tree look big, but my imagination over the last 33 years had turned the tree into one of Redwood-sized proportions. The reality didn't match up to my imagination, which seems silly. After all, it was a lovely tree, and I thought it was cute that so many people were ice skating around, as you always see on television. Plus, there were hordes of tourists taking photos and Salvation Army volunteers ringing bells to add to the atmosphere. 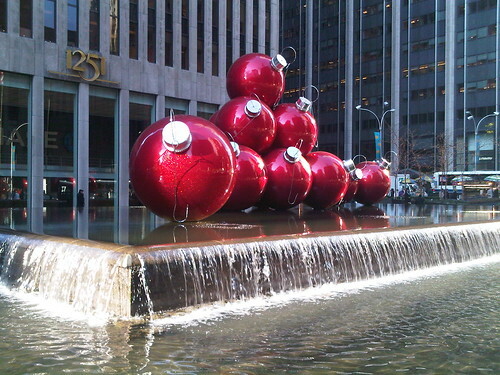 As I walked away from the Christmas tree, I came across the entrance to buy tickets for access to the roof of Rockefeller Center, aptly referred to as “top of the rock.” Again, as a kid, I'd been to the top of the Empire State Building, and even the World Trade Center, however 30 Rock would be a new one. I ducked inside, and coughed up the New York City price of $21 to ride a faster-than-normal elevator. As you ride up, there are blue lights that make it feel like you're Luke Skywalker about to blow up the Death Star. My ears popped several times during the fast ascent (and later descent). Once you arrive on the top, you want to continue to take another escalator or two to wind your way all the way up, past the lower level with glass barriers, to reach unobstructed views of the city. 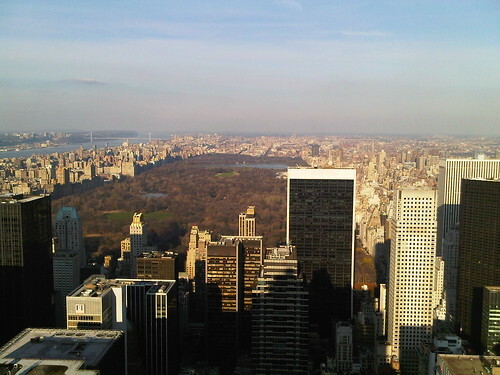 The sun was starting to set, and I was only equipped with my BlackBerry for photos, so I did my best to capture the view of Central Park. Hi Dave! It was such a pleasure meeting you and chatting about our travels and goals for our sites! Our conversation was very inspiring — I keep coming back to your comment on the moment when you began to think of yourself as a writer and editor. I look forward to seeing you again soon! I'm learning how blogging can be really empowering if you embrace it. 2010 should be interesting! :-) I also found it small my first time seeing it a few years ago. They must shoot straight up from down in the skating rink!